Jeff Denton is 19 years old and has been dancing under Kelly Dailey for nine years. Jeff began hip hop at Howard School of Dance before coming to Funk Lab. Jeff is highly skilled in choreography, breaking, popping, lock-ing, and tricks. 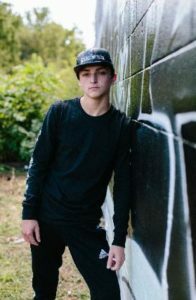 As a dancer, Jeff has won many top awards, titles, and scholarships. He is a Funk Lab original, being one of the only remaining students to be at Funk Lab when it first opened. Jeff has been a part of the Scientifik Method, Labwerk, Intensive, and College Crews at Funk Lab. Jeff won the World Dance Championships with Funk Lab’s Intensive crew in 2016. This is his fourth year teaching at Funk Lab. Jeff graduated from Fairmont High School last year and recently completed his first year at Sinclair Community College. Jeff plans to continue his dance career by teaching and dancing at Funk Lab.